ALTHOUGH APPLES HAVE BEEN PICKED for the past few weeks, the official kickoff of the 2010 New England Fresh Apple Harvest will be celebrated this Friday, September 10, at several orchards and the region’s largest packing house. Friday is expected to be a beautiful day in New England’s orchards, with an early taste of fall: sunny, with temperatures in the 60s. Saturday also should be ideal for picking apples, with sun and temperatures in the 70s, and while there may be some unsettled weather in parts of the region Sunday, either weekend day should be fine for getting out to visit your favorite orchard or farmstand. Beginning 5 p.m. Friday and through the weekend, the New England Apple Association and Massachusetts Department of Agricultural Resources (DAR) will sample apples and hand out its 2010 brochure/poster, New England Apples, at a booth at the Sterling Fair. The fair will be open Friday from 5 p.m. to 11 p.m. Bring a sweater, learn about New England’s apple varieties and take home a brochure. It has photographs and descriptions of 15 favorite varieties on one side, and storage tips, health information, a usage chart and recipes on the other side. If you are back from the orchard, Saturday’s fair hours are 9 a.m. to 11 p.m., Sunday, 9 a.m. to 5 p.m. For more information, visit www.sterlingfair.org. 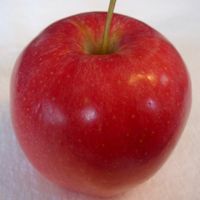 Powell and Mary Jordan, the DAR’s director of agricultural development, will give a presentation about several New England apple varieties Sunday morning at 11, including McIntosh, Royal Cortland, Gala, Honeycrisp, Rambo and Snow. Gala is a sweet, crunchy and juicy apple, with red-orange skin and yellow stripes. Slightly conical in shape, it is well suited for snacking, salads and baking. Galas were developed in New Zealand and introduced in the United States in 1934. 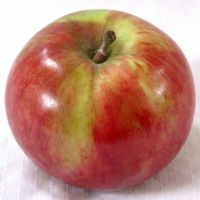 Its genetic heritage comprises Cox’s Orange Pippin and both Red and Golden Delicious. Honeycrisp is a relatively new star on the New England scene, esteemed for its exceptional juiciness and crunch. It has a bright red skin, often with patches of pale green. The inner flesh is cream-colored. The Honeycrisp is a sweet apple but retains a slightly tart flavor. It is excellent for salads or for eating as a snack. 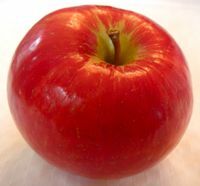 Honeycrisp was produced from a cross of Keepsake and an unnamed seedling. The original seedling was planted in 1961 at the University of Minnesota Horticultural Research Center. They were introduced commercially in 1991. Snow (also known as Fameuse) is red with pink highlights. It gets its name from its snow-white flesh, which has occasional crimson stains. A crisp, juicy apple with a slight strawberry flavor, the Snow hails from Canada around 1730. Snows are one of the oldest and most desirable dessert apples, a parent of the aromatic McIntosh. They are delicious fresh or in cooking, and are a good cider apple. Good to see all nice recipes…i just want to ask if i want some varieties of apple (only Stick) for grafting. can i get that. please help me. I am a horticulturist in Himachal (India). If you are looking for contemporary varieties, try Adams County Nursery or Stark Bros., for two. If you are looking for heirloom apples, there is Fedco Trees, Cummins Nursery, and Southwest Fruit Gardens, among others. Good luck!